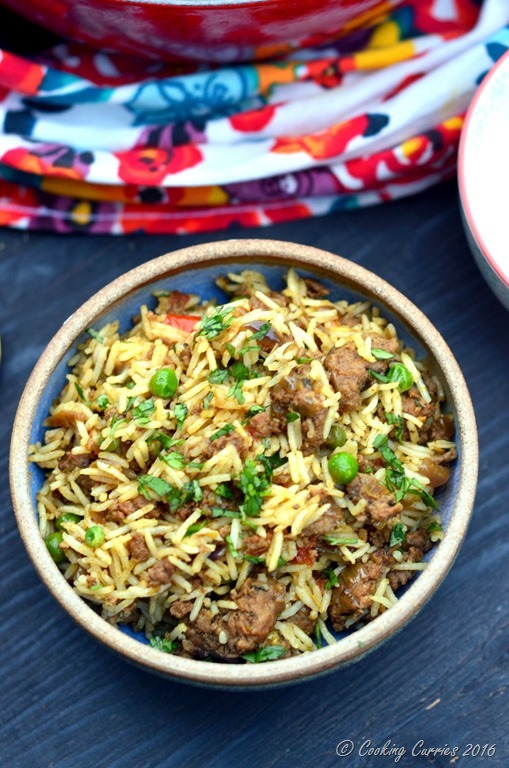 A quick and easy, can’t go wrong with it – kinda recipe for Keema Biryani with ground lamb and peas. 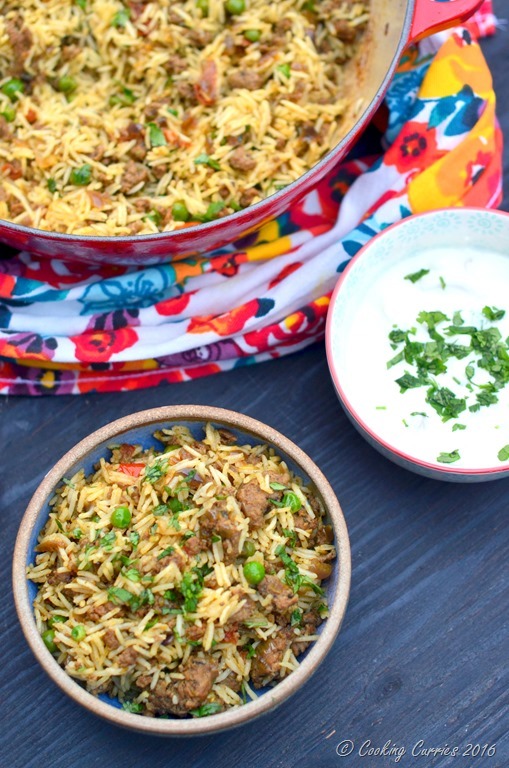 This will soon become the go-to biryani recipe in your household. 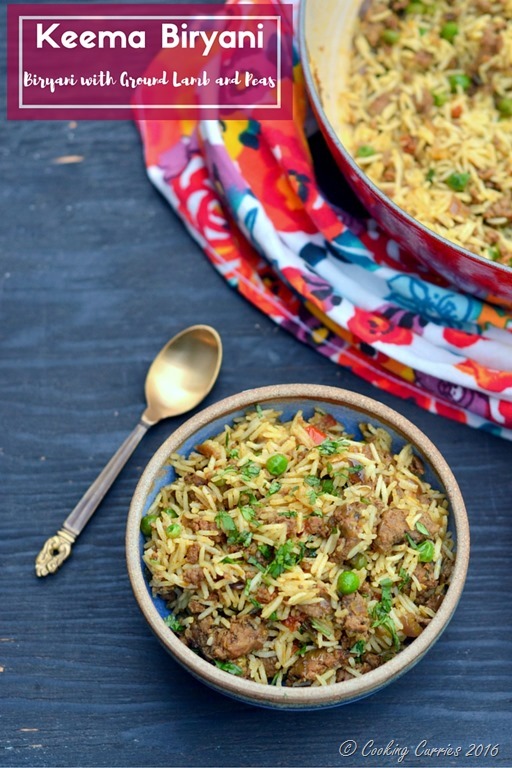 Biryani is an elaborately made and fragrantly flavorful rice dish that has its origins in Persia and then traveled through Afghanistan to India. Indian adapted it to its taste and regions and each region in India has its version of the biryani. Though biryani is usually made with some form of meat, traditionally with goat meat and nowadays beef, chicken and lamb along with fish, prawns / shrimp and chicken, there are the vegetarian versions too with vegetables and egg. The dum biryani is the most popular and probably the most well heard way of making a biryani. Marinated and cooked meat is layered with partially cooked long grained rice, preferably basmati rice and covered and sealed and cooked till all the flavors gets mixed in well. You are probably wondering that you should stop reading and go elsewhere, as this dish sounds nowhere as easy as the title suggested. Aha! That’s where you are wrong. I have tweaked the method quite a bit and essentially used the same spice mix paste that I use to marinate meat in my go-to biryani recipe and made that as a base for this biryani. And because it is ground meat, it does not need to marinate and will absorb all the flavors really quickly. Ok, I get it. It is still not a very simple recipe in itself. But it definitely is probably the easiest and simplest biryani recipe you can find. 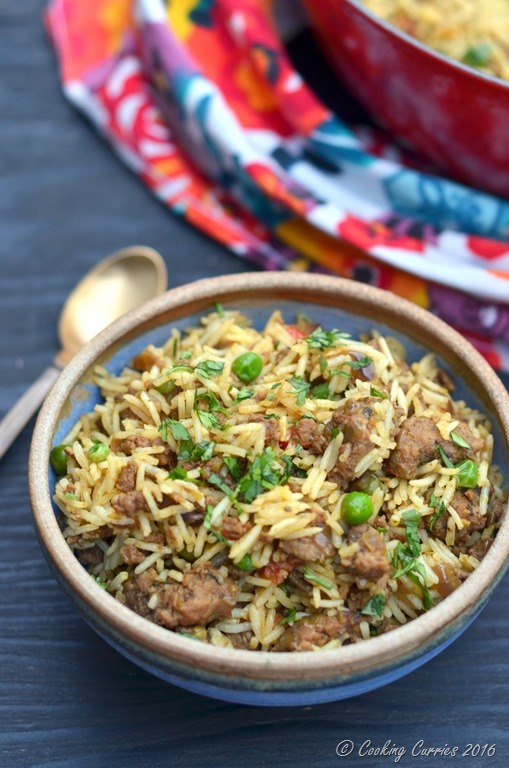 And it will definitely help with a biryani craving, if you have one suddenly, like my husband did, when I decided to make this for dinner for him and the little guy. The spice paste that I use is essentially – green cardamom, cloves, cinnamon, bay leaf, star anise, mace, black pepper, ginger, garlic, mint and cilantro. I prefer to coarse grind it with a mortar and pestle (as shown above) and slowly let the spices release their aromas. Then its just a regular curry base of cooking the spices with onions in oil / ghee or a combination of the two along with some tomatoes and then adding the meat and peas to it. The rice is cooked separately and just added to the cooked meat at the end and given a quick mix. Garnish with cilantro and if you are up for it, some ghee fried cashews and raisins and voila! your biryani is ready. Make a quick raita with onions, green chillies, yogurt and salt and you are good to go for dinner! Rinse the basmati rice in cold running water. Cook it in the 2 1/2 cups water with salt added till most of the water evaporates and little holes are formed on the surface of the rice. Switch off the heat and cover the rice and keep aside. 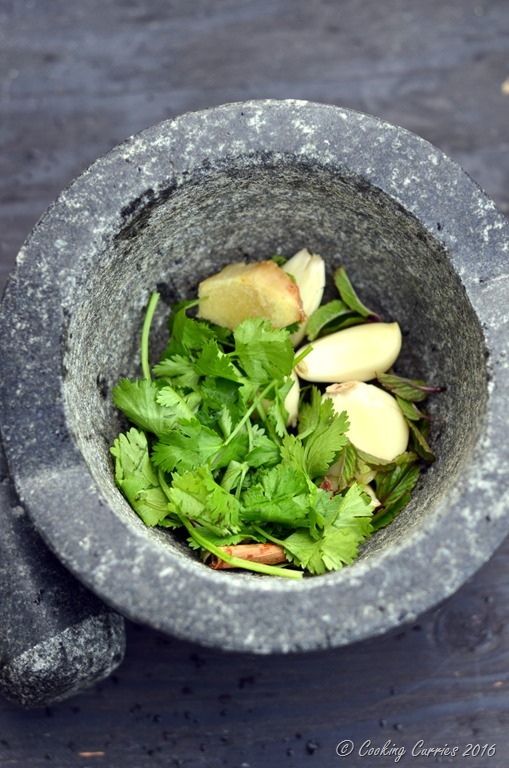 Grind all the ingredients in the spice paste list to a coarse paste using a mortar and pestle. Heat the ghee and oil in a heavy bottomed pan and add the bay leaves. Toss in the red onions and sauté till translucent. Now add the spice paste and the turmeric and cayenne. Let it cook over medium high heat till all the spices combine with the onions. Now add the tomatoes and let it cook till the tomatoes soften and the ghee separates on the side. Now add the ground lamb and salt and let it cook well. Toss in the green peas and let it all cook well together. Add the cooked rice and gently toss around to just about mix together. Do not over mix or the rice will get all mushy. Top with minced cilantro and serve with raita. I’m not a huge lamb fan, but my boyfriend loves it! Sending him a link to this recipe – he’s always looking for new way to make it and I have never seen him make anything like this before – thanks! I hope I can find all the ingredients as I’d love to try this. Looks so good! I’ve never had lamb before, but this looks delicious! Sounds like a good Sunday recipe! I’d love to try this sometime – my husband hates cilantro though, which is in most Indian dishes…do you have any suggestions on a sub or just leave it out? You can leave out the one for garnish and maybe reduce the quantity in the spice paste, I am sure the mint flavor will cover that. Or if that doesn’t work, you can leave it out altogether. Let me know how that works out for you. I did this a couple of months ago but with slow cooked lamb (which I always have languishing in the freezer). Was popular with everyone. I’ve just put some rice on to make some more. Delicious recipe. Yay!!! Thank you! Glad you guys loved it ?